The story sites the expansion of our campus and the medical school, the latter of which we’ve written about a time or two. The expansion happening on campus includes the Spokane Teaching Health Clinic and our growing health sciences programs, including the medical school. While not a specific WSU Spokane project, the University District Gateway Bridge will also help our region’s economy. The bridge’s north side will land on our campus. 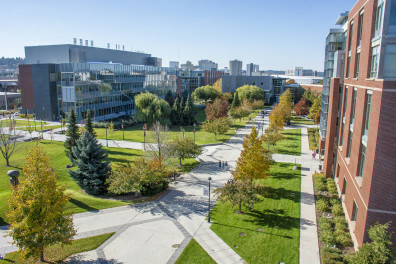 Prior expansion included the building of the Pharmaceutical and Biomedical Sciences Building on campus that opened in 2013. That building was a catalyst for bringing the WSU College of Pharmacy entirely to Spokane, adding faculty, staff and students. The S-R story also mentions research work and how it has an impact on the economy as well. Recently, we added a research team – IREACH – and welcomed them to our campus and the community. For more than 25 years now, WSU Spokane has impacted the regional economy. We look forward to our future growth (medical school, Jensen-Byrd building, etc.) and doing our part to support a strong economy.